To start our journey down the winding road of gambling, we will first start with the more well-known casino games. You may ask yourself, why do tourist love casino games so much? The answer: Las Vegas casino games provide a thrill of chance, and an allure to win big! History shows that the first Sin City casino opened its doors on April 3, 1941, naming their establishment The El Rancho Las Vegas. The western-themed hotel sat on 66 acres, and was the start of the most dazzling and lighted road in the world; the Las Vegas Strip. El Rancho’s neon windmill located on top of the casino encouraged their slogan, “Stop at the Sign of the Windmill.” From then on out, hotels and casinos grew and formed the Las Vegas desert we know and love today creating the entertainment capital of the world. As Las Vegas formed, traditional games became a must in every casino in the area. Another traditional table game found in the casinos is called Roulette, which is French for “little wheel.” When guests place their bet, chips are positioned on the board of slots that correlate with the numbers and colors on the wheel. The dealer spins the ball on the wheel, where it eventually lands on a number (Red 21). Once the winning number is revealed, losing bets are collected by the house and winning bets are handed to the winning players. Make sure to keep an eye on your odds as you play the game. Roulette can be quickly learned and enjoyed by players and viewers alike! Craps is one of the most complicated and overwhelming games you will find in the casino. You can locate one of these games by searching for the long table with many people crowded around it full of excitement! The goal of the game is to predict what number the dice will land on. We recommend that if you’re not confident enough to play craps yet, then at least take some time to observe the game. Craps usually tends to be the center of attention in the casino because of the buzz that surrounds it and how many dealers it takes to manage the table game. Other traditional gaming that can be found in almost all Las Vegas casinos consist of Baccarat, Pai Gow Poker, a variety of poker games like Let it Ride Poker and Three Card Poker, Crazy “4” Poker, and Ultimate Texas Hold’Em. Let’s not forget about the sea of slot machines available as well. If you have a favorite television show, movie, or character chances are the casino has a slot machine just for you! As the times change, we see a shift in interest when it comes to the traditional casino gaming scene. Every casino will still have the classic table games to offer, but these casinos also come with a digital version of the table game. That’s right, no longer do you have to interact with a dealer or even other players at the table. Blackjack, roulette, and more can all be played in your very own digital world. Digital dice are thrown, a digital wheel is spun, and digital dealers are created. Other new developments in the gaming industry include a variety of apps that are specific toward your Vegas trip! The first one is called myVEGAS , which can be downloaded free by both Android and Apple users and played right on Facebook. Inside the game, users play different digital slot machines for free, no deposits required! Every time you fire up the app and start playing, you can earn real M life rewards that can be used towards hotels, restaurants, and more VIP treatment. Millennials are the focus when it comes to the future of gambling. Let’s face it, everyone loves Vegas no matter the age. So, what are the next steps when it comes to targeting the younger generation; making casino games resemble video games, allowing players to gamble with a more skill-based aspect. 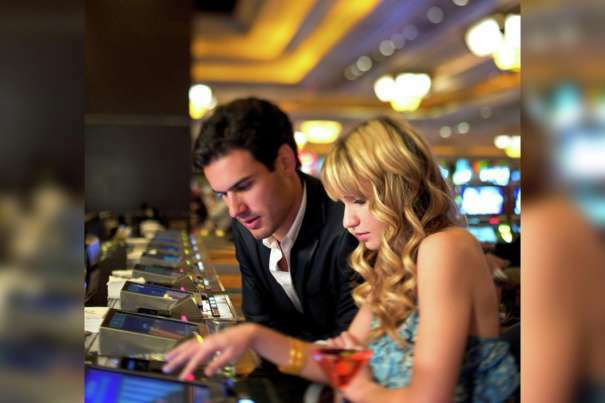 With the demographic of Vegas visitors always changing, the gaming must change as well adding in more social and skill elements to increase activity. The popularity of mobile games and video games continue to rise, so why not take note when it comes to revamping the casino? The future is looking bright for Las Vegas casino games!